This article understands how to block access to websites on a home or office network. The necessary components required for the same is understood. 1. Purchase a router which has URL filtering feature. Wireless routers with URL filtering. The URL filtering feature on a router takes the URL of the website as input and blocks it on the router. 2. Setup the router with basic necessary parameters like internet configuration , wireless security etc. 3. Identify the websites which needs to be blocked on the network and provide it as an input in the routers URL filtering section. A snapshot on a router with URL filtering feature is shown below. 4. Provide the name of the websites in the appropriate text box as shown above. Once the URL’s are provided , the appropriate websites would be blocked for the users on the network. 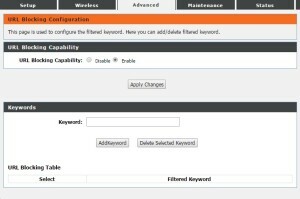 Check out wireless routers with URL filtering feature here – Wireless routers with URL filtering.